Bumper guards are customized pieces of equipment that attach to your car bumper, protecting it from bumps and scrapes at low speeds. They’re particularly useful for parallel parking situations in big cities, where the roads are busy and fast-paced. Although they won’t stop major damage from a fast impact, they’re ideal for other situations. The Luv-Tap BG001 is a universal-fit bumper guard, which provides full cover protection to the entirety of your car's bumper. It falls into the upper end of the budget range for car bumper guards, but the price is justified by its quality. 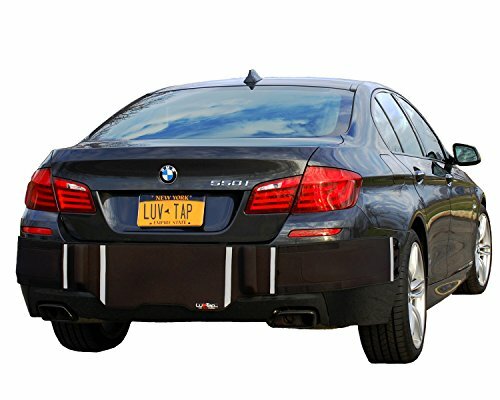 The Luv-Tap Bumper Guard attaches securely to your car's bumper using a combination of suction cups and bungee cords, with the former being included as part of the package. This does away with any need for custom tools when setting it up. The material conforms to the natural contours of your car’s bumper to preserve its stylish appearance. This bumper guard is crafted from a malleable neoprene design, making it ideal for absorbing low-speed impacts from other vehicles, protecting against both impact and scratch-related damages. This material is also machine washable, meaning that it’s all-weather resistant, too. The adjustable and supple nature of the material means it is adjustable to fit practically any regular-sized vehicle. Though this product isn’t particularly difficult to install, it does take quite a bit of time in comparison to some other bumper guards. This is in part due to the side pieces that attach separately to the main piece, something that also makes them feel more susceptible to falling away from the car or being stolen. Another minor niggle is that the cut-out for the license plate is too large for some cars. 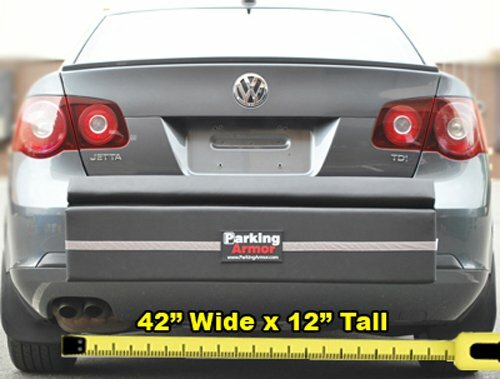 The Parking Armor 4.2 Bumper Guard is a mid-range product that offers rear protection to a range of vehicles. It’s suitable for small to mid-range cars, though it may struggle with larger vehicles such as trucks. Made out of foam, the Parking Armor 4.2 is not easily deformed and will spring right back after an impact. Steel wires running through the Velcro attachments make theft or accidental loss while driving unlikely. The material used for the construction of this bumper guard offers additional padding, decreasing the likelihood of damage to your fender. It also comes in 3 horizontal sections, which not only means that it’s easy to fold and store, but also means that you can use it to protect your trunk when loading luggage into the back. As far as bumper guards go, this Parking Armor model isn’t as attractive as rubber products from other brands. It has one of the usual complaints for guards, in that the corners of your vehicle won’t be covered, and it’s also not impervious to water due to the choice of fabrics. The Platinum Edition Bumper Bully guard is the biggest, thickest, and strongest bumper guard offered by the brand, with premium coverage for larger vehicles. Though this doesn’t always mean enough coverage for corners, it’ll protect against bumper damage from rear impacts. 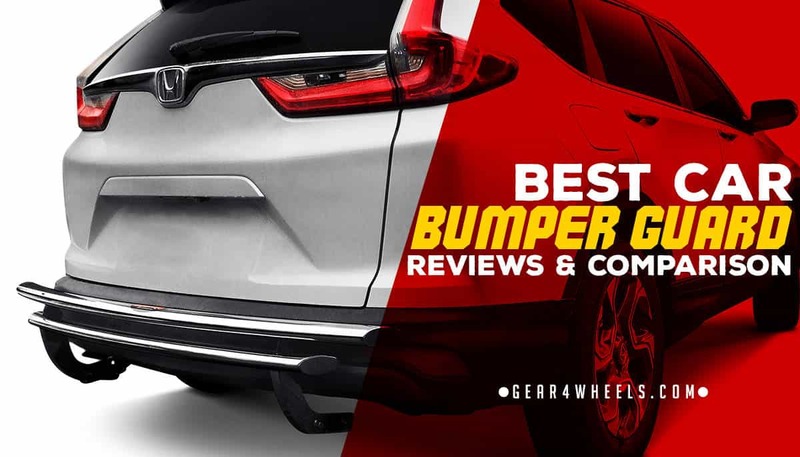 The Bumper Bully Platinum Edition is built for larger vehicles, with a PVC-free rubber design that is resistant to sagging over time, as well as durable enough to withstand scrapes and low-speed impact damage. It has built-in reflectors and is easy to fit and remove from your vehicle. This model of Bumper Bully bumper guard features rear impact pads, meaning it can absorb more momentum than most models. Safety reflectors also help your car stand out in the dark, which further helps to reduce the potential damage of a dent to your fender. The reflectors are a neutral platinum color, which help maintain your car’s original style. When it comes to securing the guard in place, the straps are reasonably bulky; they can also cause problems for some cars with trunk stoppers, as they cannot be re-positioned. This means that although the guard is big enough for most vehicles, it may not fit specific builds. ​The Bumper Bully Black Edition comes with fewer bells and whistles than its counterparts; it does not feature the same reflective strips or steel-reinforced straps as some of the other models in the series. As the name suggests, it is literally the all-black edition, and comes in at the lower end of the budget. This bumper guard can be folded down when not in use, making it easy to ferry around in the trunk. It has tough straps that help to reduce the chance of slippage, and is crafted from PVC-free rubber, which keeps it malleable yet resistant to tearing or permanent indentations. Some people may associate durability with weight, but that’s not the case with this guard; it’s relatively lightweight without being weak. This is a surprise given that the straps feature steel wiring to prevent breakages. One of the most crucial factors for an accessory exposed to the elements is for it to be waterproof, which this guard is not. It also shares the most common complaint among guards of not protecting your bumper corners. What’s more, some users have reported abrasions between the guard and the bumper itself. The Gold Edition Bumper Bully Extreme is an outdoor bumper guard that provides protection to your rear bumper only, without any corner coverage. In price terms, it's about mid-range, though there are some premium touches that improve the quality and value for money offered by this product. The materials used in the making of this bumper guard include premium grade rubber, which helps the guard to maintain its shape, both in typical use and after a bump. It’s one of the better-looking guards on the market, due not only to the reflectors, but also to the attractive branding. Despite its low price, the bumper guard holds its shape well with no sagging, helped in part by the straps that are steel-reinforced. There are also high-intensity safety reflectors built into the rear of the guard, which help to light up the vehicle in poor light settings. 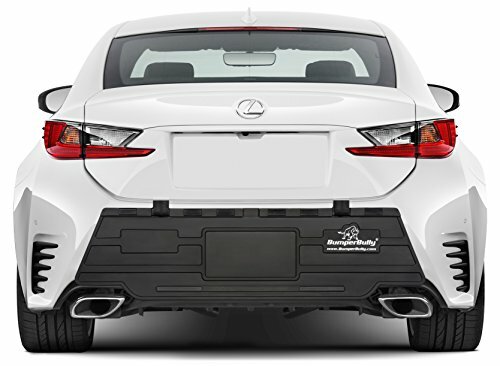 Unfortunately, where some other models have full wrap-around protection, this bumper guard only offers protection to the rear, with the side corners left exposed. When it comes to pulling out of parking spaces, these are vulnerable spots. The Velcro used for attaching the guard is also low in quality and not always sufficient on its own to hold the guard in place. The clear winner from those bumper guards we’ve reviewed is the Luv-Tap BG001. Unlike any of these competing models, the Luv-Tap features a two-part attachment system consisting of suction cups and cords, meaning you’re less likely to lose it. It’s also the only neoprene-crafted model, meaning it’s not only resistant to the elements, but it can be machine-washed, too.